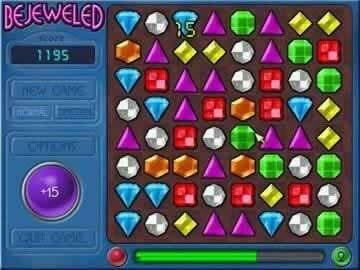 Bejeweled Deluxe Game - Download and Play Free Version! Incredibly addictive, easy to play but tough to master Bejeweled is one of the best ever! 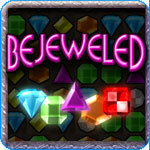 If you haven't experienced the game that made the Puzzle genre popular on the Internet - you must give Bejeweled a try! Also knowns as "Diamond Mine", this game challenges your mind to think quick and make fast visual connections. Learn to think in completely new ways through this gem swapping puzzle game. Bejeweled Deluxe is one of the most captivating puzzle games ever created. It is so simple to play - just arrange gems so they match with 2 or more of the same kind - but it is so much fun!! Get 3 or more matching gems in a row and the gems disappear, causing gems in the rows above to drop down. Get 4 or five in a row for bonus points. Score even more points for chain reaction matches (gems that drop down and create matches). Make a certain number of matches and you move on to the next round where matches are worth more points. Game play ends when you have no possible moves left or when the bonus bar runs out in the higher levels. For more ways on how to play better, see our Bejeweled Strategy Guide! Also, for more Bejeweled action and with even more ways to play, try Bejeweled 2! Play Bejeweled with family, friends, or by yourself whenever you like - there are no time limits in the full version. Enjoy unique electronic music while you match new gems and create new combos that propel your scores even higher! Save your high scores for own personal challenge or compete with family and friends!